I’d like to preface this post with a little bit about myself. I’m a huge fan of Hideaki Anno and to an extent all of GAINAX senior staff including Kazuya and Shouji and those who worked on Gunbuster and Evangelion. Tengen Toppa Gurren Lagann was my first true exposure to Imaishi and it pretty much solidified him in my mind as one of the best (and most unique) animators in the industry today. So when I finally decided to watch FLCL around 2008 (I was mega late to the party), the prospect of Kazuya and Shouji co-directing, with Tadashi and Imaishi doing key animation almost sealed the deal for me right then and there. Luckily, I managed to watch through the entire thing without having too many heart attacks. It has since been a decade or so since the original release of FLCL. To commemorate its recent re-release on Blu Ray, I decided to give the show a rewatch. Thus here is my one-third review, one-third fanboy fest, one-third analysis of what I consider to be the greatest anime of all time. 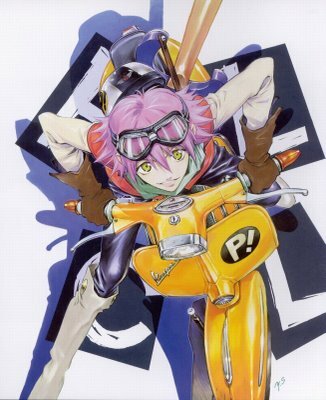 FLCL aka “Furi Kuri” aka “Fooly Cooly” came into being during the year 2000. In all respects, it became the precedent of which all subsequent anime would henceforth be compared to. Not only did it take a great stride forward by combining themes of post-modernism and avant-garde imagery. It featured classic storytelling and a well-defined cast of characters to back it up. Is FLCL comedy? drama? romance? science fiction? I’d say it’s a little bit of everything. Evangelion, whom Anno and Kazuya worked on together previously, presents itself as a serious show with a deep (some may argue borderline pretentious) message. On the other hand, FLCL is inherently a non-serious show trying to be funny, but in the process, achieves what Anno could not. That is the psychological portrayal of liminal youth in a fashion that is entertaining above all else. 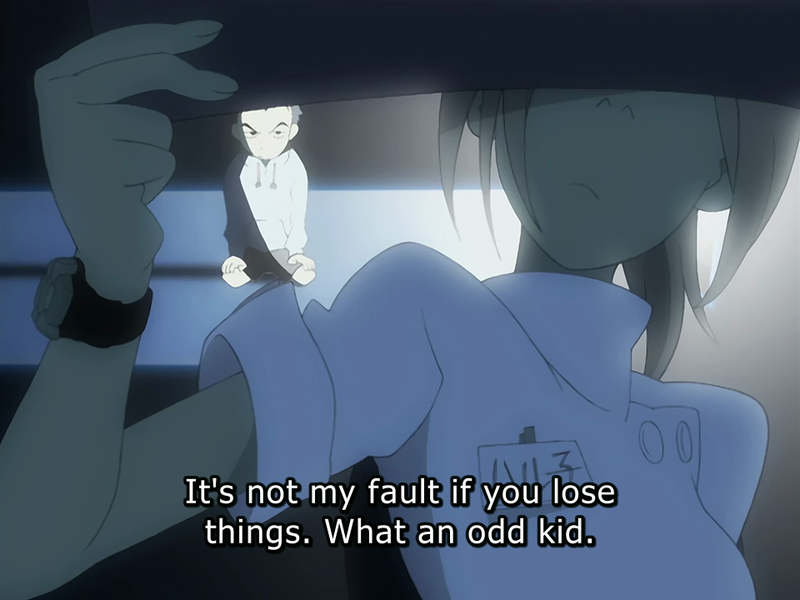 People often times misunderstand the overall message of FLCL due to the sheer level of slapstick and randomness. In fact, that is one of beauties of FLCL. People can totally miss the point, but still enjoy the show at surface level. However, those who are willing to look deeper will be rewarded. Nothing explained to us explicitly. The creators intended us to make inferences and draw our own conclusions. As you may have realized, there are a plethora of symbols, parodies, sexual innuendos, and just outright craziness that comes bundled with FLCL. Strip away all those layers, however, and you are left with a simple coming of age story. A story about a boy growing up and accepting who he is. A story of new beginnings, both in their world, and ours. This first scene is particularly powerful. It begins with Naota and Mamimi talking to each other (did you catch the Ashita no Joe reference?). As “One Life” starts echoing in the background, the scene does a great job setting the tone for Mabase City. As we’ll soon learn, Naota is at the age of puberty. He is unsure of how to handle the advances of the older Mamimi, who is also Tasuku’s girlfriend. He is constantly split between acting in accordance with reason or emotion, a struggle which manifests itself throughout the entirety of the show. Great entrance or greatest entrance? 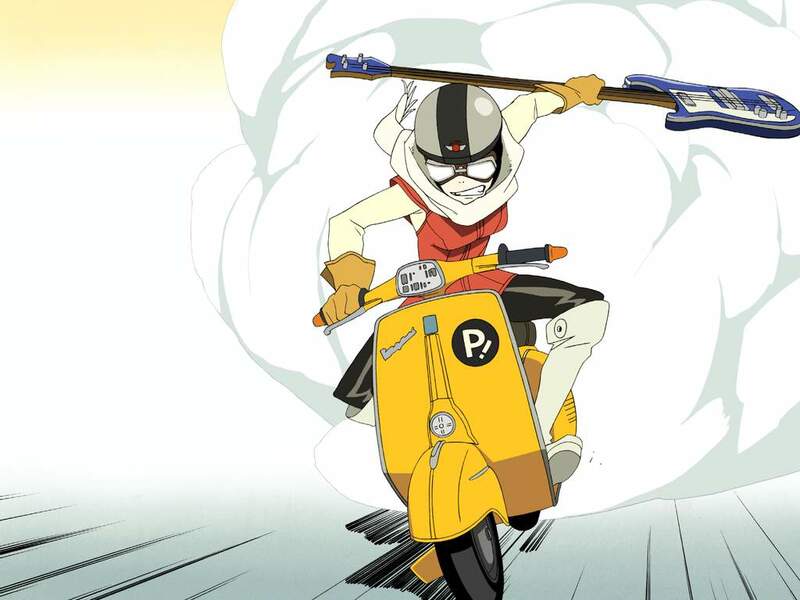 The first time we see Haruko in action, she charges in unexpected, screams “Lunch Time!” and slams her guitar into Naota’s face. 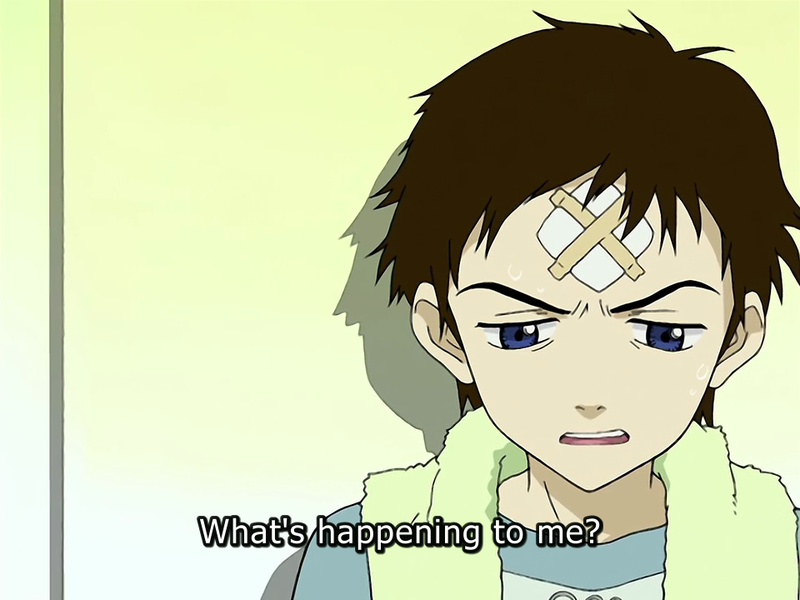 Later, Naota discovers a “horn” protruding from where he was hit. This entire scene just felt so random after I first watched it. A strange lady on Vespa, speeding at 400mph and rams a little kid in the head, and then she’s gone the next instant. Remember, Naota is a kid on the brink of puberty (he refers to it as “growing up”). Haruko’s entrance symbolizes the confusing nature of puberty – hitting kids like Naota randomly out of the blue. The first hostile robot to emerge from Naota. The imagery is reminiscent of the mass produced Eva units in Evangelion (Hiromasa Ogura acted as Art Director for FLCL). Canti is not the typical Japanese robot. He’s got a TV screen for a head and the “piloting method” is significantly different from traditional mecha anime. 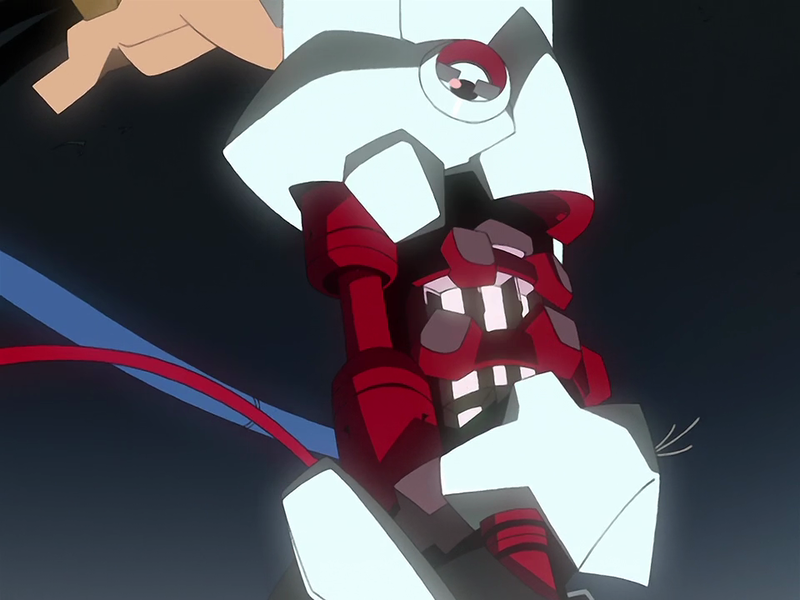 In later episodes he actually eats Naota and uses his body as ammunition for the mounted cannon. The actual meaning of this is made clear in later episodes. Haruko, having noticed her wrist ring shaking immediately heads for the scene where Canti and the MM robot are fighting. She swings her guitar and hits Canti on the head hoping to release Atomsk. It backfires and instead Atomsk fades away, as apparent from the robot turning from a bright red to a greyish color. A pivotal point in character development for Naota. He begins to view Haruko the same way he views Tasuku. This is the beginning of Naota’s fascination with Haruko. From this point forward, Haruko is comparable to Tasuku in Naota’s eyes. In the episodes to come, his feelings for her will be repeatedly put to the test. Mabase City represents the Japanese “everyday boring life.” In a sense, it also represents the status quo of Japanese society post-world war II and moving forward into post-modernism. The story starts with Naota voicing his discontent of his life and everyone around him (“nothing ever happens here”). This all changes when Naota meets Haruko for the first time. Haruko’s “swing” reminds Naota of his brother. Thus, Mabase City becomes the battlefield in which many of the different struggles apparent in the show take place. The Medical Mechanica facility is described as the ominous clothe-iron like building overlooking all of Mabase City. It arrived in Mabase under mysterious circumstances before the start of the series and is seen bellowing white smoke that covers most of the city. If Mabase City is a metaphor for the traditional Japanese everyday life, then Medical Mechanica is a metaphor for foreign intrusion, mainly of ideologies. Post-WWII imagery is very much present here, especially regarding the capitalist and materialistic society that was brought on by the end of the war. The MM robots (of which two are seen so far in episode 1) are all based around household appliances. 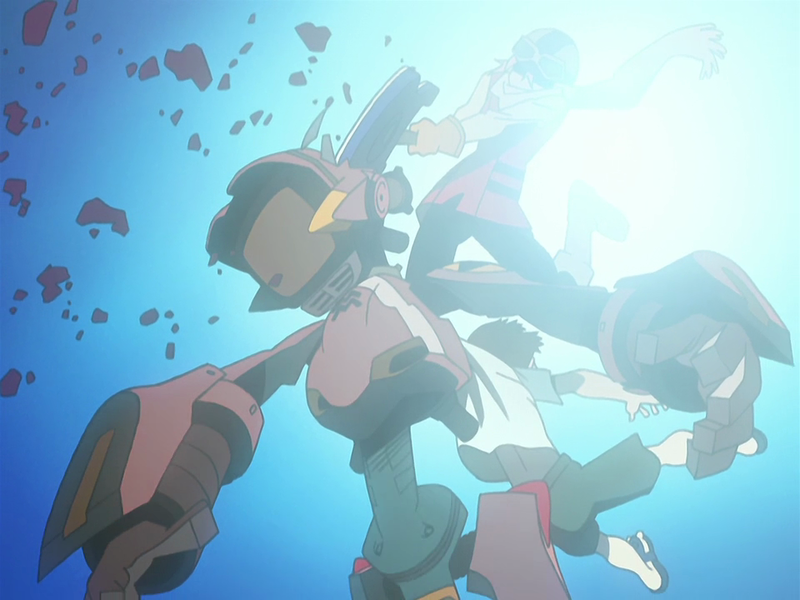 The robot Canti, which emerged from Naota’s head is a representation of “mass media” with its head the shape of a Sony television set. The white colored eva-esque robot which emerged with Canti looks to be some form of deformed tea pot. Naota describes the smoke that covers Mabase as an omen of sorts. The smoke is in reference to the far reaching effects of capitalist society brought on my American ideals. One recurring motif in FLCL is the difference between character’s handedness. It is heavily implied that left-handed people are inherently different from right-handed people. In the context of society, right-handed and left-handed may speak to the political and social ideologies of left and right doctrine. The right-handed are seen as the authoritarian figures, while left-handed the components of the system. 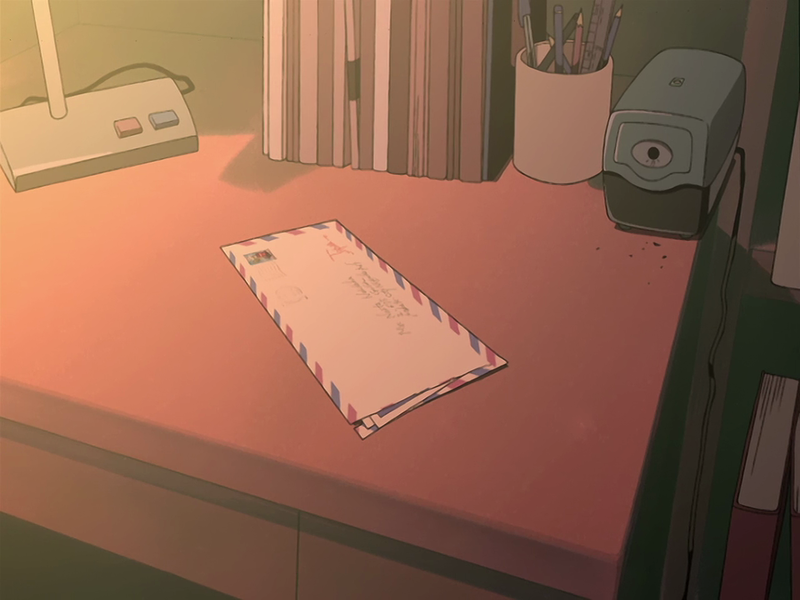 Within the show, Director Tadashi reveals in the commentary that left-handed people are “cooler, carefree, outgoing, and seem to be able to do everything easily and well.” They are the “fortunate” ones in society, the ones that get the big breaks when they need them, without worrying so much about the consequences. 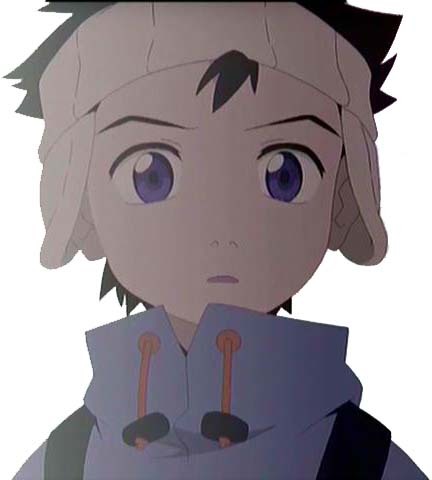 The 12 year-old Naota is the male lead of FLCL. The first scene in the show depicts him as a rather self-disclosed, depressed boy (comparable to Evangelion’s Shinji Ikari). It is important to note, both Naota and Mamimi are right-handed. He lives with his father and grandfather in Mabase city. There is no mention of a mother figure anywhere, which perhaps explains Naota’s awkwardness around Mamimi. 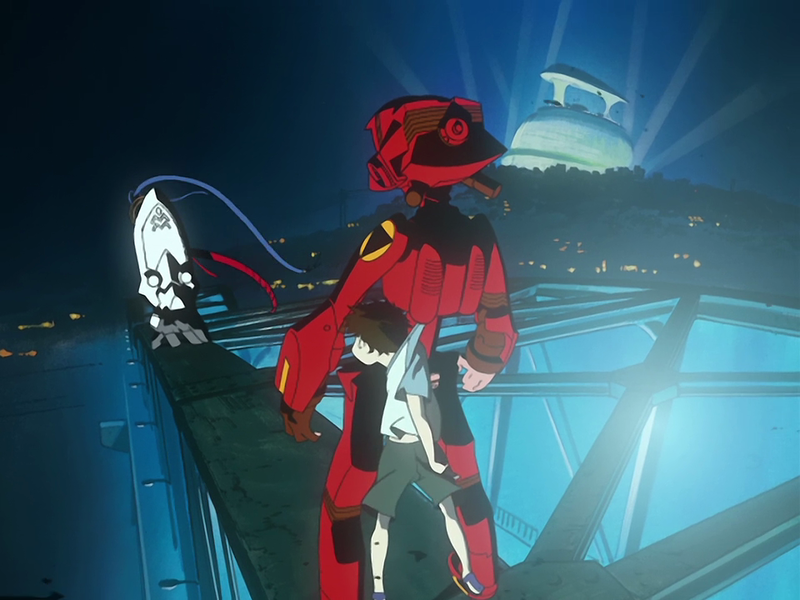 In a classic anno-esque twist, the lack of maternal figure in Naota’s life is expressed in a twisted manner when he himself “gives birth” to Canti. The role reversal is such that it is due to Haruko’s “swing” that placed the seed inside Naota’s head, he is able to become a metaphorical mother to an alien robot hybrid. Naota’s relationship with Haruko is also ambiguous at first. He initially thinks of her as an adult who won’t grow up and feels awkward when he finds her in his house. Naota soon becomes intrigued by Haruko and what she represents, essentially new and “fun” things in a boring monotonous lifestyle. Though his relationship with Haruko varies throughout the series, in a way, Haruko becomes the mother that Naota never had. Tasuku is Naota’s older brother whom we don’t actually see in person. We are instead provided clues and hints as to his character and whereabouts in the form of telephone calls, letters, and shots of jets flying overhead. He is represented primarily by the top bunk, which Naota treats as a shrine of sorts, and a bat which Naota frequently carries around. It is heavily implied that Naota and Tasuku had a very close relationship and that Naota looked up to his older brother. In stark contrast to Naota, Tasku’s left-handedness makes him everything that Naota wants to be. He’s good at baseball, and has a girlfriend in Mamimi, who also looked up to Tasuku because of his personality. It is implied that Tasuku is well known around town and is very popular amongst the people of Mabase City. On the other hand, Naota is often labeled “Taro-kun” or “that younger brother of Tasukun.” Tasukun wears a number 3 baseball jersey, the same number as the famous player Shigeo Nagashima. Before the start of the series, Tasuku leaves Mambase City to play baseball in America. The time of the initial release of FLCL coincided with the boom of Japanese baseball players traveling to America to play in the major leagues. If Japanese high school students were proficient enough at baseball, chances were high they’d be scouted to the American leagues. By going to America, Tasuku is portrayed as having “succumbed to American popular culture and commercialism.” Something which Naota is still torn over, having believed Tasuku “betrayed” him and the city by no longer caring for his family and friends. In episode 1, Tasukun even asks Naota to break the news to Mamimi that he has been dating another girl. Tasukun may seem like a minor character at first, but he plays an integral role as the catalyst for many of the negative emotions felt by both Naota and Mamimi. 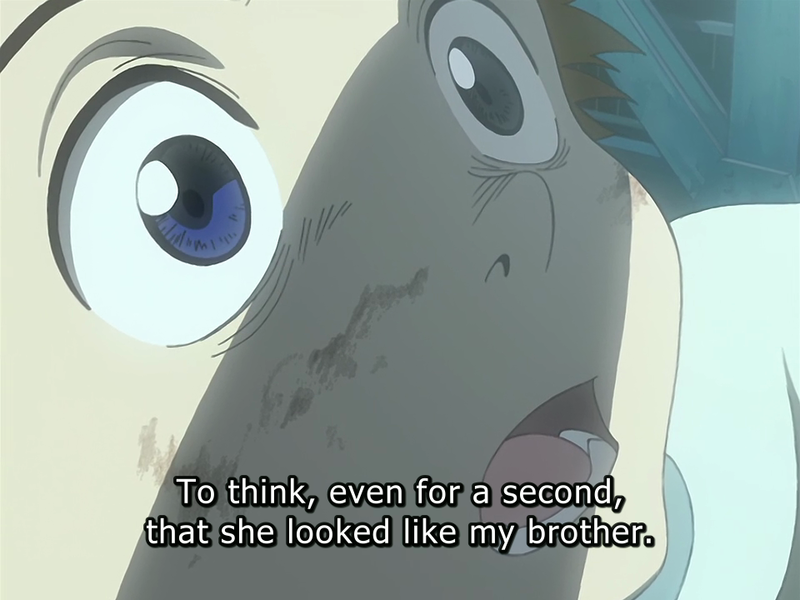 In the same way, Naota will often call out his brother and it is implied that Tasuku’s name holds a mysterious power. This power is later revealed to be that of Atomsk. Haruko is an alien in every sense of the world. In the show she’s an actual alien that comes from outer space in search for Atomsk. If Naota’s life is representative of liminal Japan, then Haruko is the foreigner or “alien” intruding upon Japan. 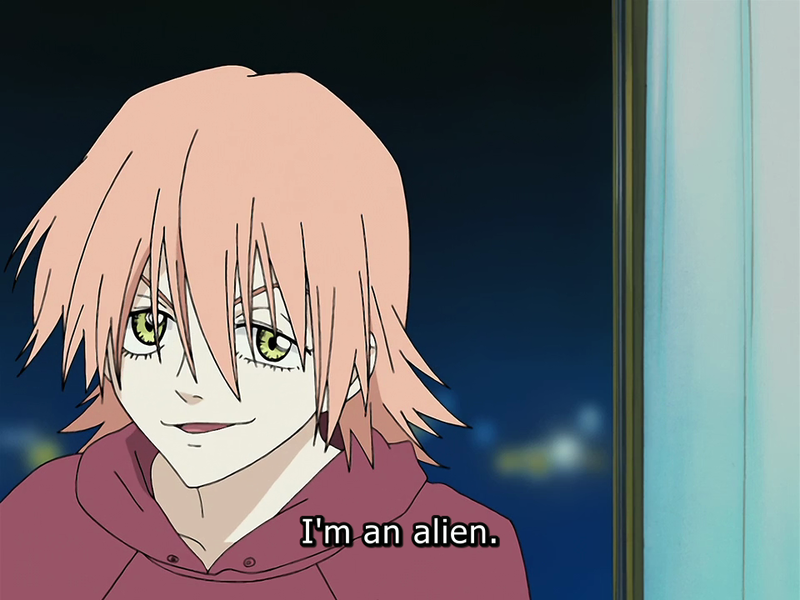 Everything about Haruko’s character is “alien” to Japan. The vespa, a symbol of dominance, the guitar, a symbol of popular American culture. Haruko quickly becomes an influence to Naota quite clearly (she reminds him of his brother). Her influence on Naota symbolizes the “invading” influence of the United States after world war II. Haruko’s relationship with Naota is a peculiar one that isn’t really detailed until the second half of the series. The main reason Haruko came to Earth was to find Atomsk. 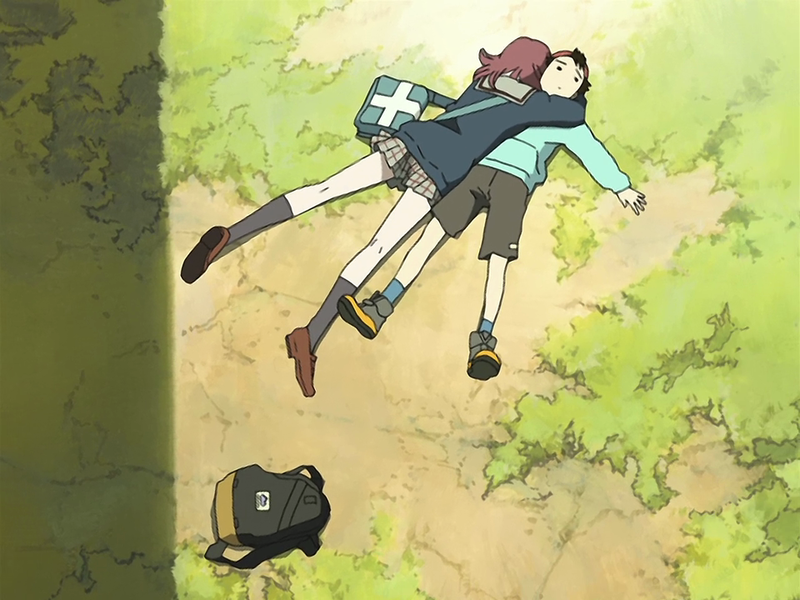 Naota was never supposed to be anything more than a means to an end. She has the ability to open “N.O.” channels by hitting people in the head. By doing so to Naota, she believes she can pull Atomsk across an inter-dimensional link to this particular star system. However, she soon realizes that Naota can only generate “lesser MM robots” and not Atomsk like she intended. Thus, she begins to get close to Naota in the hopes of “strengthening his head” so to speak. This involves her teasing Naota many times, even going so far as to sleep with his father as she knows it will make Naota feel jealous and hurtful. When all is said and done, they do start to show signs of a relationship, though to what level and extremity remains ambiguous. Haruko is in many ways a subversion of the “anime girl.” Unlike typical anime heroines, her voice is often hoarse and awkward. Her demeanor is not always representative of the “perfect” anime girl. She is rugged, attractive, while not being burdened by certain stereotypical characteristics. This entry was posted in FLCL and tagged Comedy, FLCL, Gainax, Hiroyuki Imaishi, Kazuya Tsurumaki. Bookmark the permalink.